The 2016 Ford Mustang follows in a legendary line of sports cars offering tremendous performance. Cutting-edge technology combines with classic design to put forth a 2-door performance vehicle that lives up to its impeccable reputation. Ten exciting trim levels fulfill the options for 2016 Ford Mustang: V6 Fastback, EcoBoost Fastback, V6 Convertible, EcoBoost Premium Fastback, GT Fastback, EcoBoost Premium Convertible, GT Premium Fastback, GT Premium Convertible, Shelby GT350, and Shelby GT350R. Sleek, sporty, and aerodynamic design makes for a car that just looks plain fast. Classic hues are evident in the 2016 Ford Mustang, along with a contemporary sophistication that balances on the best of both new and old worlds. The wide mouth grille and bold hood make the forefront of the Mustang stand out in an unmistakable fashion. Standard highlights include HID signature headlights, signature LED tri-bar taillights with sequential turn signals, and dual exhaust pipes. On convertible trims, the roof is electric-powered and can raise and close in seconds to protect from weather or let the sunshine in. 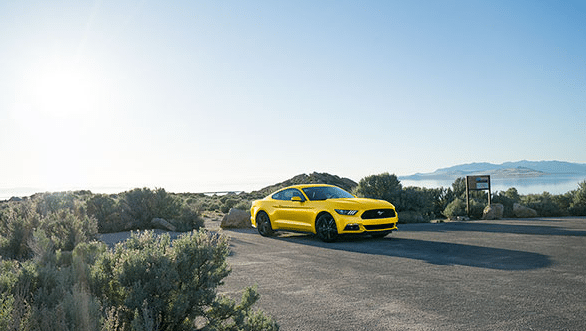 Twelve wheel choices are available with 2016 Ford Mustang ranging from 17- to 20-inches to suit your needs and style. Also available are twelve body-colour choices so you can further express your individuality through your Mustang sportback or convertible. Additional appearance packages are available so you can customize the Ford Mustang to your heart’s desire. 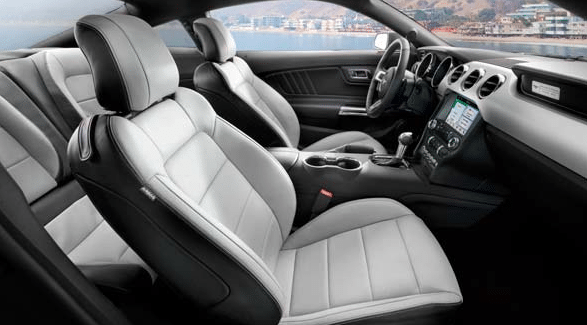 Comfortable seating for four people is found inside the cabin of the 2016 Ford Mustang. Cloth seating is standard with available leather options that include contrast stitching, as well as available heated and cooled seats. Interior trim features soft-touch plastics, with available diamond-mesh aluminum and Satin Brush trim. In terms of cargo space, the fastback trims feature 383 litres of space, and the convertibles can be filled with up to 324 litres of space. Infotainment is met by the standard Ford SYNC, featuring a 4.2-inch colour LCD screen, also available is the industry-leading brand-new SYNC 3 system with an 8-inch LCD touch screen akin to most smartphone screens in terms of clarity and touch-responsiveness. Both systems utilize real-world, natural voice commands for ease of use and optimal functionality, to keep your attention where it should be while driving. 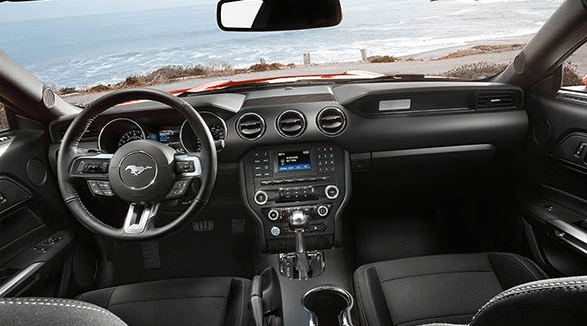 The 2016 Ford Mustang’s available voice-activated navigation system combines GPS technology with 3-D mapping for voice-guided turn-by-turn directions to get you to your next destination seamlessly. The 2016 Ford Mustang is met by four outstanding engine choices to fulfill whatever you are looking for in a sports car. The classic 3.7L V6, the 2.3L EcoBoost, the bold 5.0L V8, and the ultra-powerful 5.2L V8 are available to deliver the utmost in power or efficiency, or a nice balance of both. 3-mode power-assist steering is standard, and available performance packages upgrade the radiator, sway bar, springs, and more for a superior driving experience to take your Mustang to the next level. 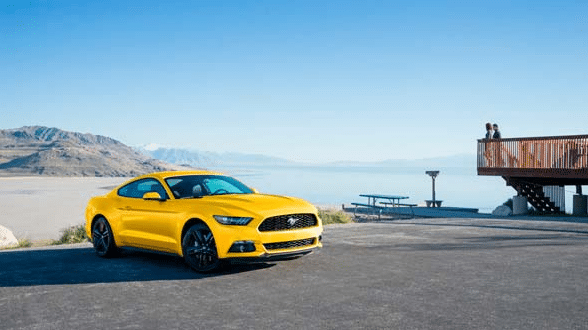 A contemporary take on a legendary classic, the 2016 Ford Mustang is a premier sports car. With unrivalled performance and efficiency, along with the latest technology and features; the new Mustang is an ideal everyday vehicle with distinctive style and a thrilling ride. Treat yourself to what you’ve always wanted in the 2016 Ford Mustang. Visit your local Okanagan Ford dealer - Watkin Motors Ford, to test drive the 2016 Ford Mustang or another new Ford model. Watkin Motors Ford has a vast inventory of new Ford cars, trucks, and sport utility vehicles to suit whatever you are looking for your next new Ford model!